Your car needs proper care and protection from any external force that can cause damages to it. Your love for your car will be made evident in your readiness to do everything possible to protect it from damage. In the market today many auto car sunshades are available, but most of them are basically built for a particular weather or season. 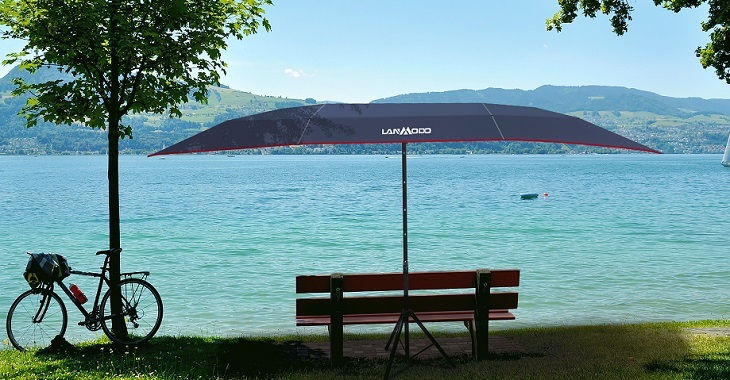 The Lanmodo Pro is a technologically improved automatic sunshade for car. It is built for the four seasons of the year including summer, autumn, winter, and spring. The heat coming from the sun will not reach directly to the car under the coverage of this umbrella. The Lanmodo pro 4.8M * 2.3M is built with fabric with a capability to absorb almost all the heat of the sum coming to the car, which is important in controlling car interior temperature. With the help of this anti-heated theory, your car interior will remain cool, and comfortable even with intense hot summer sun. The temperature can be maintained at 40.9°C or 105.62°F oppose to the 77.3°C or 171.14°F of a car without coverage. The remote control provided alongside this auto umbrella is the main reason why you can relax inside your room or office and open or close the umbrella with a press on a button. Therefore, automatic is among the key features to easier use of your car protection. The Lanmodo Pro comes with fabric size large enough to completely cover different vehicles. The size measures, 4.8M or (188.9 in) for the length and 2.35M or (71.0 in) for the width. Therefore, it is large enough to cover vehicles of various shapes, and sizes. It is large enough to cover fully vehicles such as: Car, Vane, Truck, Jeep, sports car, Sedan, station wagon, hatchback and lots more. In that regard, whatever your car type, shape and size, this car cover can be large enough to completely cover it for guarantee protection. The season of the year is never a problem for your car to be protected with the help of Lanmodo Pro. It is a four-season car sunshade serving perfectly in summer, spring, autumn and even winter. So, change in weather or season of the year is not going to make you fear or frigate knowing for sure that your car is completely protected from any effect of a change in season. That is what made it important to go ahead and take advantage of this wonderful car sunshade irrespective of the season. With the snow proof and shaking system, you can be sure of using your car without the need to start scooping snow out of your car every morning. That means experiencing full protection as well as easy to maintain and clean with the Lanmodo sunshade. It can protect your car perfectly against snow, bird poops, hail, dust, and others. The better opportunity you need to enjoy comfort, pleasure, and safety on the camping ground can be granted with the help of the Lanmodo Pro. With the large tent size, you can be sure of covering your entire family member in the camping ground. The winter snow will never be a problem for you while on the camping ground through the snow shaking system provided. More so, Lanmodo Pro can be suitable for your beach party, with wall charger, car charger and even tent pole provided. Your fishing can be made more exciting with the LED lamp built in this car umbrella.